When conducting a survey, there is always a risk that only those who are already regularly using the software will participate, and that’s why the first question was about the CN usage frequency. 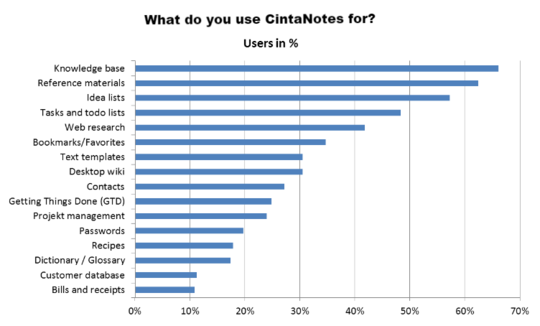 As expected, the majority (55%) of the participants stated that they use CintaNotes every day. However, 11% of the participants admitted to not currently using the software, and we are thrilled that these people not only participated, but also provided reasons for their skepticism, which turned out to be extremely valuable knowledge. 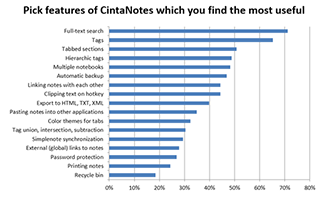 However, more people than we expected are using CintaNotes for task management and to-do lists. This means that we’ll prioritize related features: better support for tasks and a reminder system. 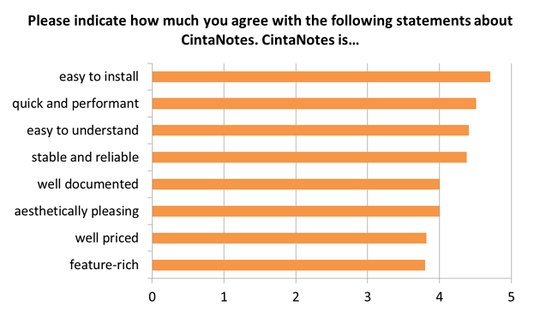 The majority agrees that CintaNotes is easy to install, quick, simple, and reliable. However, the product’s documentation, user interface design, feature set, and pricing policy received less favorable ratings. It seems that this is where we should be focusing our efforts. Probably the documentation was rated poorly because it was available only in English (the worst marks here were given by people taking the survey in Russian or German). We are already working on the German and Russian versions of the site with localized documentation, and then other languages will hopefully follow. Many people think that CN’s user interface looks a bit dated, and we tend to agree. We plan to do a major UI “facelift” in version 3.0, which we already started developing and which will come after the current major milestone, version 2.9.5 with file and image attachments. We agree that a lot of features are still lacking, but as you can imagine, it is quite difficult to keep the software simple and stable, and at the same time constantly expand its feature set. As one of our respondents pleaded, “a fantastic application – but PLEASE, PLEASE in the name of “Development” DON’T add levels of bloat and make it sluggish, less easy to use etc… for me it’s just PERFECT as it is! !” All I can say here is that we’ll continue to try our best to strike a balance between simplicity and usefulness; we’ll optimize performance when needed, reorganize things to make the UI clearer, and cut features that no one is using. However, one of the participants pointed out a problem with our pricing policy: regardless of how many times you renewed the updates subscription, the price of upgrading to the Lifetime license remained the same. We agree that this is not quite fair, and in the near future we’ll introduce special discounts for upgrading to the Lifetime license for those who renewed the regular license at least once- stay tuned! 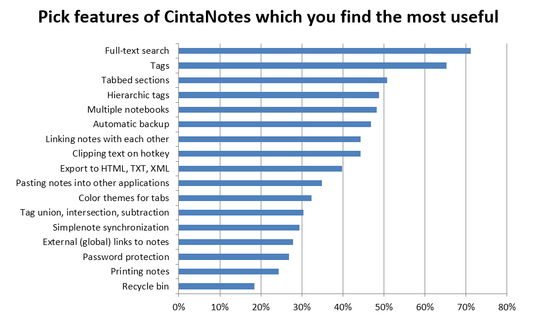 As we expected, our users ranked full-text search and tags as the most popular features. It came to us as a surprise that the Ctrl+F12 text clipping function scored only the 8th place, we used to think that fast clipping was an important distinctive feature compared to other software. I consider the results here to be inconclusive, and we’ll probably need to do some more research here. Clearly recycle bin is on the last place not because it’s not needed. It’s just basic function which people have come to expect, and the same goes for password protection and printing. No big surprises here as well – the most wanted feature is ability to attach files and images to notes, it is also top rated on our roadmap. This feature is now already almost finished and will appear in version 2.9.5 later this month. The first beta version is already available on the forum. We can see that the named usability problems have quite a strong relation to the answers to questions 3 and 5. Only 23% of respondents reported that CN ever froze or crashed on them, which we consider to be a good result, but will still try to improve stability in the future. We’ll investigate every reported crash or bug. Special thanks to those of you who specified detailed problem reproduction steps. 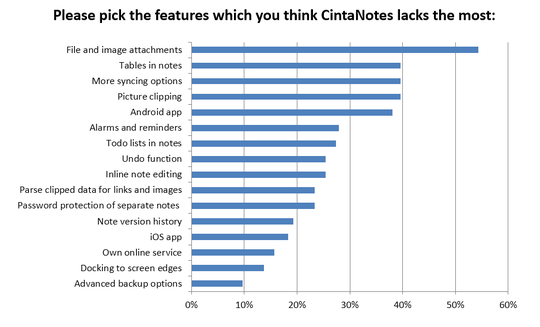 Question 8 asked if you’d recommend CintaNotes to a colleague or a friend. About 83% of the users would recommend CintaNotes to someone else, and only about 4% would not, which is quite a compliment for our work. We asked this question because we want to know who our users are. 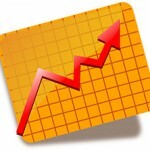 The results confirmed our expectation that the majority of our users are highly educated professionals. Information technology sector dominated among occupations, which pops the question if we should consider prioritizing features aimed at IT professionals such as syntax highlighting and such. Other than that, we’ll need to revise our pricing policy and improve the documentation. If you’d like to discuss the survey, its results, and our conclusions, you’re welcome to do it on our forum in the designated topic. Thank you very much for helping us drive CintaNotes development forward!